Cagliari Walking Tour / Excursions / Consulting for travel agencies, tour operators and tourism publications. 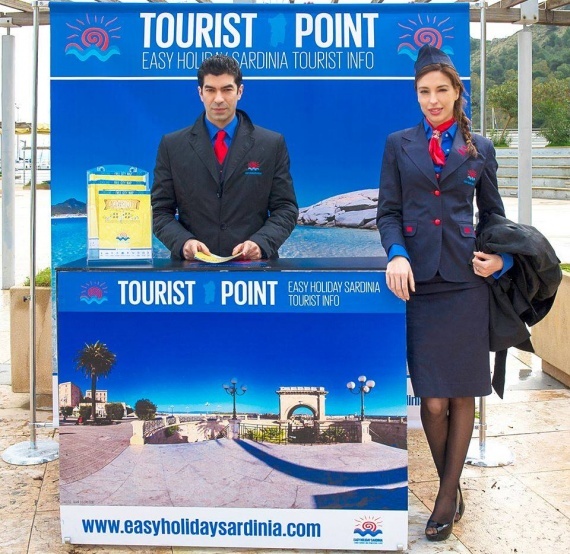 Easy Holiday Sardinia is a new born firm born thank to the idea of a group of resourceful and young fellows. Our mission is to advertise the Sardinia district with innovative, promotional tourist services as much as Europe and the rest of the world. Our team is highly trained and experienced. You can find us in the major tourist arriving points with our information desks. Our aim is to give the tourist the right information to get to know our precious island, tell its traditions, present its wine and food products, handicraft, its boroughs and tourists interests companies with some new and fresh services we developed for you. We designed our maps and brochures that you can find in our information desks, and can be personalised. We also offer other services for tourists and local companies/organisations: accompany your visit throughout the city, personal shopper service, information on excursions and tours; advertise and promote companies, organise promotional events, hostess and steward services, flyer supplying, tourist support and expert advising. Make your innovative choice: experience EasyholidaySardinia!